Use the WHITE VERTICES to alter the size of the composite solid shown below. Be sure to answer the questions that follow. What 2 solids make up (COMPOSE) this composite solid? Describe. Suppose the semicircle (above) has a radius of 6 inches. The distance between the 2 orange points is 10 inches. The distance between the bottom orange point and bottom white point is 15 inches. If this is so, describe how you would find the volume of this composite solid. As you describe, find its volume along the way. The base of this composite solid ("bottom rectangle" is not shown.) Yet suppose, for this question, this rectangle is there. 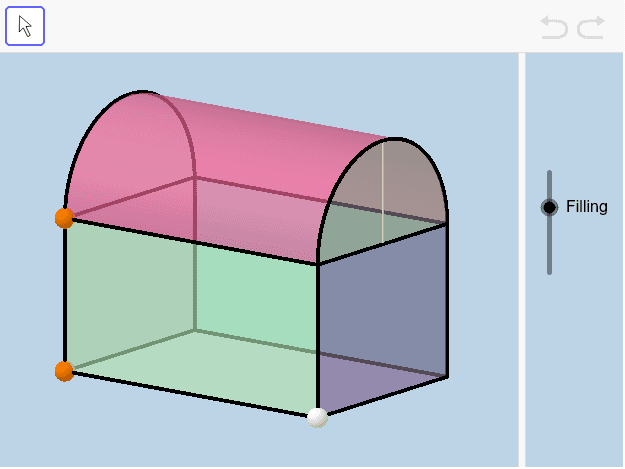 How would you find the total (outside) surface area of this composite solid? (Assume the same dimensions given in question (2).) . Find the total surface area of this composite solid within your description.